This is a pretty odd piece. Although it's made of plaster (the material from which most of the Kenner coins were sculpted), it is not an original sculpting. Nor is it a hardcopy or a softcopy. In fact, a read through our Special Feature concerning the production process behind the POTF coins will reveal that it doesn't really fit comfortably into the series of steps known to be involved in the development of these coins. Since it's detail is negative, it must have been created by pouring plaster over a positive piece. 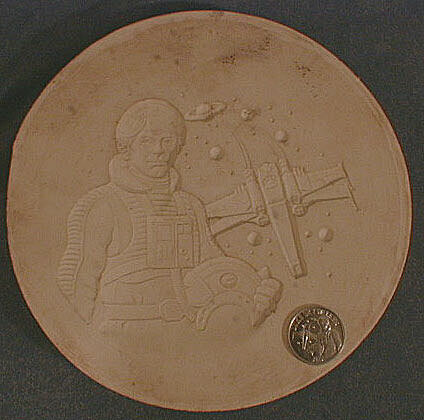 Close observers will note that while the "stage 1" hardcopy of the Luke X-Wing coin does not include the Saturn-like ringed planet among its details, this plaster casting does. This ringed planet was present on the first coin produced, the small version of the Luke X-Wing coin, but not on the production version. It's possible that this piece is a product of some series of modifications made to the coin between these two aluminum incarnations, or even that the earlier version was made using a different prototyping process than that used to create the standard coins in the POTF line. Whatever the case may be, this is a neat piece.